Are we Hindus too tolerant? I do not claim to be a scholar of Hindu philosophy or Hinduism. Considering some of the decisions Government took from 2004-2014 and looking at certain portions of History, one would come to a conclusion that Hindus are either too weak or too tolerant. We are perhaps tolerant and not weak. Despite Hindus being extra ordinarily tolerant, there are those who teach tolerance to Hindus don't understand, the faith teaches seeing divinity in everything. For Hindu Nationalists, our history starts with Raja Bharat or even before. For Secularists, our history starts with Jehadi attack on Sindh. The Afghans, Turks, Mughal and British came to India, ruled, looted, and converted beheaded, divided and walked away. The atmosphere has been so created by the media and previous Government that it is right in India to say “I am a proud Muslim”, “I am proud Christian” is fine but when I say “I am a Proud Hindu" I am communal. Who will decide? With every Hindu festival an advisory is isuued...During Diwali, we are told not to burn crackers. During Holi, we are told not play with colors. During Navratris ,we are told not play loud speakers. Will these seculars ever suggest a bloodless Eid? In a District in West Bengal, Hindus are not allowed to cremate their dead without permission from administration as it is a Muslim majority area. One can abuse Hindu God in the middle of the street. A painter can paint Hindu Goddesses in most derogatory position and get away. Let someone do so with any other community to understand what tolerance is and what violence is. Census of 2011 was not made public by the Government. 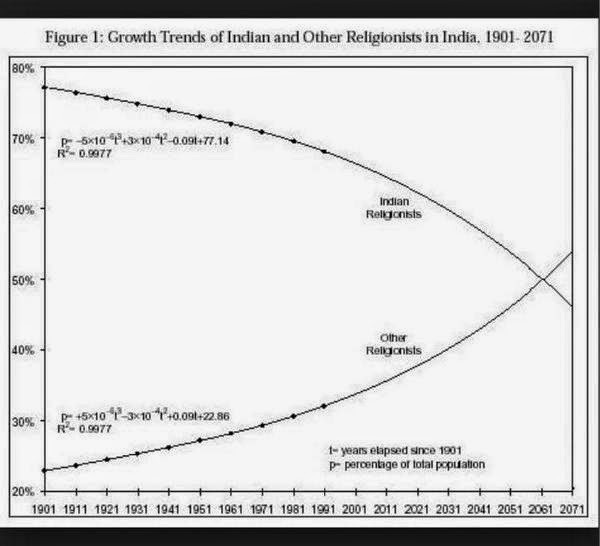 It is obvious from the figures that with passing time, Hindu population is declining. A report published by Pew Research Centre, internationally shows; Hindus will be a minority by the year 2071, thus implying India will be an Islamic State. Is it time for a Uniform Civil code In India? The Hindu salutation 'Namaskar' means that I bow to that divinity in you.